Longview, TX: On September 2nd, 2017, Blackhawk Transport and Logistics provided transportation for Greggton Methodist Church to deliver flood cleaning supply buckets to a Church in Conroe, TX. These were delivered by Blackhawk driver, David Brooks. Cooter Brown’s Bar in Burleson, TX and American Legion in Alvarado, TX sent diapers, water, clothes, food, cleaning supplies, etc. to American Legion Post 33 in Beaumont, TX. These were delivered by Blackhawk driver, Bobby Nixon. “With all of the recent devastation and destruction caused by Hurricane Harvey, Blackhawk Transport was very excited to be a part in the relief efforts of Greggton United Methodist Church of Longview, TX and The American Legion of Burleson, TX area. The dedication of our two drivers, Robert Nixon and David Brooks, enabled two 53-foot trailers of relief supplies to be distributed in the decimated areas of South Texas. These guys went above and beyond driving into areas where the unknown was the norm. Thank You! Without the unselfish acts of the Blackhawk Managers, Christian Porter, Jet Livingston and Edrieck Payne, the coordination of our transports to these areas would not have been possible. It is very good to know that when people are hurting, others will step up and lend them a helping hand, no questions asked,” acknowledged Lew Rowden, Blackhawk Transport SW Regional Director. Allen, TX: A group of neighbors and friends organized a relief aid campaign for Puerto Rico in Allen, TX. Blackhawk Transport and Logistics provided the ground transportation to get the supplies to Miami, FL to be flown into San Juan, Puerto Rico on Oct. 24. 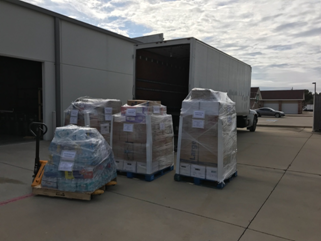 The supplies consisted of pallets containing bottled water, toiletries, personal hygiene items, diapers, baby food, shoes, canned food, and clothing. “It goes without saying that without your (Blackhawk’s) support we would not have been able to get the relief aid from Texas to Puerto Rico,” commented Elliot Monteverdes-Torres, relief aid coordinator. Blackhawk Transport Regional Director, Lew Rowden, and Account Manager, Jet Livingston, were vital in making these moves happen. “I’m happy to be a part of this team of good people in our company and our customers who are able to work together to help others when it really counts,” stated Jet Livingston. About Blackhawk Transport and Logistics: Blackhawk Transport and Logistics was founded in 1990 to provide high quality transportation services for a wide variety of commodities. They operate 31 dedicated accounts throughout the US with their National Support Center located in Beloit, WI. One of Blackhawk’s greatest values is ‘Give Back’ – they express gratitude for what they have by donating their time and resources to help improve their communities.